It has been great fun to let my dear Irish Cottage sit while I catch up on a myriad of other projects. It has been quite a bit since I straightened up my stash. 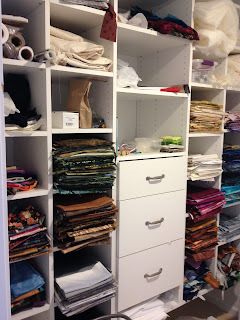 I had installed some storage shelves about 18 months ago with an eye to organizing my fabrics. Needless to say, buying new material and pulling the old in and out took its toll on the organization factor. 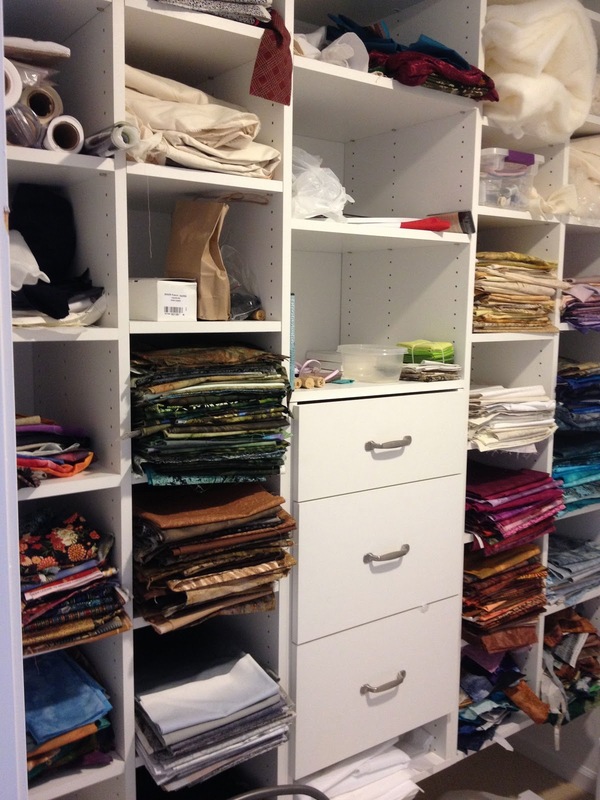 So, over the past week, I have gone through many of the cubbies and re-sorted things. One of the rewards for my perseverance was the discovery of a small piece of gray silk that was exactly what I wanted for part of the roof of my cottage. 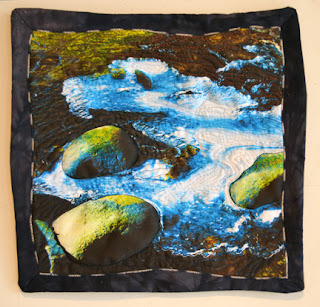 This piece is a machine quilted digital image, adapted from a photo that I took this winter in Aspen. 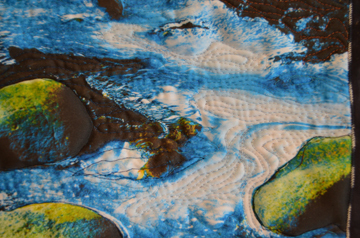 Here is a detail view of some of the quilting. Sure hope that someone bids on it during the auction! It is Off the Wall Friday, so please check out other posts by artists at Nina-Marie Sayer's blog. By the way, Elaine Quehl has a great article on copyrights on her blog. I love your SAQA donation piece. Perhaps seeing yours will motivate me to finish mine! I like both pieces you have shown. Great 3D effects, especially in the second one. Both of these are stunning Judy. Amazing what we find when we do an archaeological dig in our stash. Mine is always being unearthed. It is nice to get your fabric sorted, I am always amazed at the things I find! Love the SAQA piece! The grey is a perfect addition. Wonderful shelving, looks like you are getting organized..could use more here. Great SAQA addition! 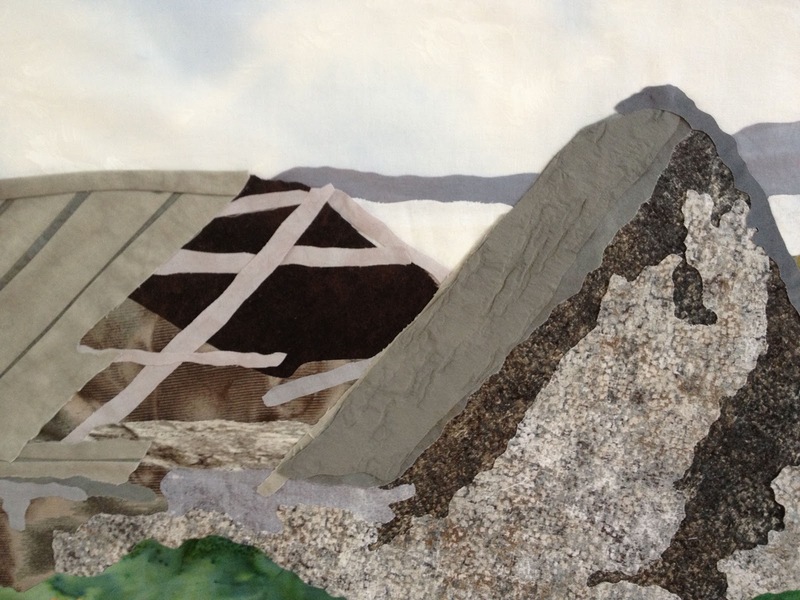 ohhhh love seeing your SAQA entry - lovely! Interesting piece, I can hardly wait!